Right after the O at the beginning are two lower-case Cs, and again, that's a long S rather than a lower-case F.
The middle word is 'yt', an old abbreviation for 'that'; the last is 'society', spelt with a long S and an -ie ending. Early 18th century writing is not something I'm familiar with. I have absolutely no training in paleography, the study of reading old handwriting (although I'm pretty sure that mentioning this to medievalists would just get me laughed at since this is practically modern, what's all the fuss about?). But I'm getting quite fond of it, because a) once you understand how the abbreviations work and how letters often get written, it's not that hard to understand, and b) my actual specialisation is in the nineteenth century. You want to see what nineteenth century handwriting looks like? Hmm. Does that look any better in context? 1. Set alarm for stupid o'clock. 2. Wake up twenty minutes before taxi arrives, having carefully timed everything to waste not a moment's sleep. 3. Swear as taxi arrives 7 minutes early. Hurry, drop hairbrush, stub toe, swear again, belatedly apologise for being noisy, kiss boyfriend goodbye, race out for taxi. 4. Get to dark and dismal bus station to find bus already nearly full of inordinately cheerful people. 5. Bus leaves 15 minutes early. Ponder enthusiasm of everyone in the country at this goddamn time in the goddamn morning. 6. Get to airport. Go to get money out. Realise debit card is in jeans pocket, back at home. Try credit card instead. Realise credit card is also in jeans pocket. Oooh, this isn't good. 7. Phone bank, to be told that telephone banking is not open this early in the morning. 8. Google bank, to be told that all other enquiries except for 'I want to open an account and give you lots of money!' should be dealt with via telephone banking. 9. Count cash. Wonder if there's enough there to get a coffee now and to get train fare to destination after plane lands. Look up fare, discover coffee is 20p too expensive. Swear quietly to/at self. 10. Google various combinations of 'holy hell I am stranded without a debit card and with hardly any cash and I have to decide right now whether to get on a plane that will take me several hundred miles away, what do I have to do to convince the bank to give me money when I get there?' Answers unsatisfactory. Sigh. 12. Decide upon plan A - get to destination, go to bank, possibly fake tears, produce passport AND staff card AND all other photographic ID on person, beg for money - and plans B-D, which are more complicated but at least bring the total of Possible Outcomes In Which I Am Not In Serious, Serious Trouble to 4. 13. Wistfully watch other people drinking coffee. 14. Get plane. Carpe diem, etc. 16. Phone bank. Explain situation. Am told that cash will be given at the discretion of the branch in question. Mentally count three branches within walking distance of destination, decide odds must be fairly good. 17. Get to first branch. Explain situation. Look pitiful. Receive cash. 18. Realise, once immediate money situation is solved, that feet have been rubbed to blisters by raggedy insoles and now I cannot walk one more step without yelping. 19. Get insoles. Limp to destination. My cousin added me as a friend on Facebook. This is a cousin that I think I've met once, when I was twelve and she was eight and we had a lengthy disagreement about what colour rosettes got first prize in horse shows (her: blue, me: red - a US/UK divide, it turns out, argued out in a small English town due entirely to our different choices in horse books). Anyway, nice to speak to her again, in the only conversation I've had with anyone from that side of the family since 1992. My dad's side of the family mostly lives within a ten-mile radius of where I grew up, and I know none of them. My dad's mother lived a fifteen-minute drive away, and I met her once, at the age of seven, for half an hour. She always sent me huge amounts of toys for Christmas, all things like dolls and girly make-up sets and other things nobody who knew me would ever have bought, things lovingly wrapped in pink paper that might as well have been printed with 'I know nothing about this little girl, but damn it I am going to buy presents for my granddaughter!' I thought this was really sad, that she clearly thought a lot more about me than I ever had about her, until I was older and found out that my dad had left home at the age of five for pretty good reasons. After which I thought it was sad in a whole different way. But, I don't know; she was an unmarried teenager when my dad was born, which can't have been a great situation in a small English town in the fifties. She was a much less crap mother to my dad's much younger half-siblings. Anyway, what I was going to say is that it's really nice to be in contact with my cousin. And to find out from her profile pictures that my hypothesis re: every relative within three degrees of separation from me having curly hair continues to be compelling. 1) Yes. Precisely as sore as it looks. 2) There was this hill, and the way down was a really steep path through some woods, all twisty and turny and full of tree-stumps and stones, and the ground was so dry and loose that it would just skid away under your feet, and if you stepped wrong you'd just go flying, see? And then just before that path, there was a big, grassy flat bit containing one (1) rock, rising up through the turf in some ancient geological grudge just in time to catch my knee on the way down. So that's where I fell over. 3) Well, obviously better shoes. 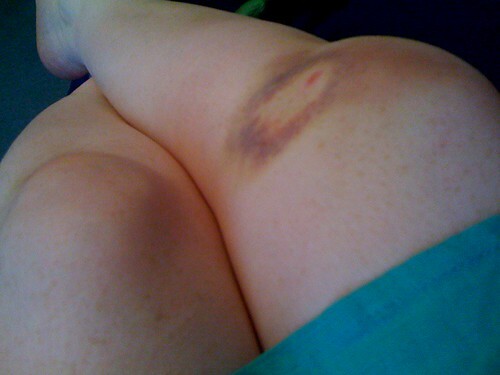 4) Because if I wore jeans I wouldn't be able to milk this for so much sympathy. Raaaaaaaain. Rain rain rain rain rain. And I am not at all complaining, because this comes at the end of a week where the air's been so close and muggy that outside feels like a washing machine after the cycle's just finished. Inside is better, not because of air conditioning - nowhere I work or live has air conditioning - but because I work in an old building with thick walls, and plenty of cool surfaces to drape yourself over when the weather gets too much. Which it does, even in here. So now it's pouring with rain, and that's fine. This week has been busier than I'd like it; I'm currently The Person In Charge of our student workers. This is mostly not a problem, as they're great and can get on with things by themselves, but some of the software we use has picked this week to throw a grand-scale You're Not The Boss Of Me tantrum, and that we could have all done without. Also, this week has been less fun than it could have been, due to continued worrying over my brother and my dad and the recent revelation that my landlord is moving back to this country and probably wants her flat back. This will be thirteen moves for me in eleven years, including several unexpected and unwelcome events like this one, one set of landlords that were so divorced from reality and threatening with it that the police had to get involved, an assortment of neighbours ranging from the weird to the intolerable, and enough expense in moving and taking time off work to do it and getting movers and paying deposits and overlapping rent periods that I could probably afford a fair-sized payment on a house of my own by now if I hadn't had to pay it. I swear to God, whatever I did to a landlord in a past life must have been epic. And with thick, humid weather on top of that, the kind you can't even breathe in - yes, I am very, very glad of today's thunderstorm.